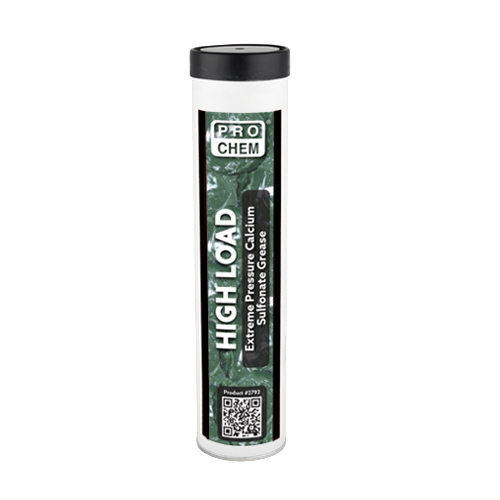 HIGH LOAD | Pro Chem, Inc.
HIGH LOAD’s formula and manufacturing process has been perfected over the years to produce the best quality Over Based Calcium Sulfonate Complex Grease with outstanding performance in severe operating conditions. The process is controlled to maximize calcite formation and minimize vaterite. This makes HIGH LOAD have outstanding pumpability characteristics where other sulfonate greases fail. This high performance, extreme pressure grease has outstanding film strength and resistance to corrosive saltwater environments. It is made with premium base oils that give equipment a long life and protects against chemical and thermal degradation. It keeps equipment free from metal to metal contact ensuring the best protection, even under very severe operating conditions. It does not contain any harmful additives. For best performance, fully purge the competitor grease out before applying appropriate amount of HIGH LOAD grease. Reapply as needed.